What’s change? It’s not about the seasons or about the months. It’s all about the few things which we accept and few things which happen by one’s knowledge or accidentally! Some people will not be ready to accept the changes that happen in their lives,but change is the good at some point of life. What if there is no change at all? One cannot know the value ,difference of the colourful life. Since the day is changing from morning to evening,this world feels good at the end of the day because of the whole change happening. The life is colourful and blissful for people because of the change they undergo through ages .There will be no childhood,teenage ,young age ,middle age and old age if there is no change, and if people remain the same infants there is no point in birth and death! “Change in life might flush away good things but it always gives better things to life”.Life will be always the same old,boring one if there is no change. Change is needed for everyone and everything at certain point of time. People even should change but one shouldn’t change their priorities,some people even tells that few persons change, but truly people never change only the situation changes. People always remain the same with the same attitude till the end. So one should accept the changes that happen in a willing way or unwilling way and enjoy the fruitful joy of it. 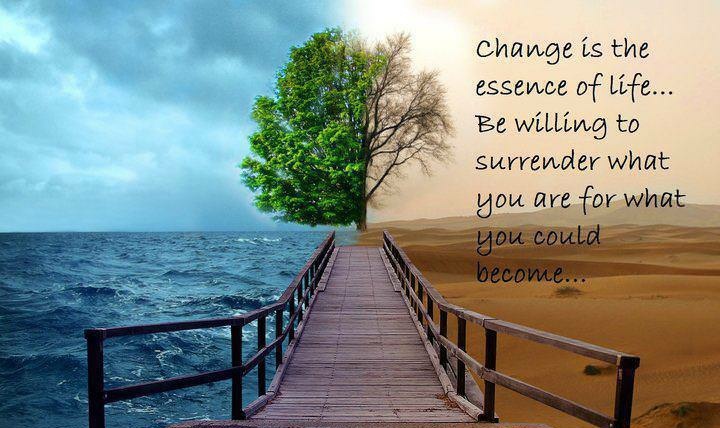 Change is the essence of life which is needed as the catalyst for the fruitful and blissful reactions in the future. A man said to me: The winner in life is experiencing the most. Happiness, sadness, challenge, despair, surprise, and all the other things that can be experienced on earth. If I do the above, I have to change. That’s the whole point of life I think. 🙂Glad you liked it! I’ll be happy if some can get inspired by my writing’s ,even it might be little!